For day two I thought I'd give the sock bun a shot. Here's how this one works. Find that holy sock that you mean to throw away every time your toe pokes through but then for some strange hoarding-type reason you wash it and stick it back in your drawer. Consider using old socks as arm warmers. Think that you could cut a thumb hole where the heel is. Vow to at the very least buy a long sleeved shirt with stripes. Apologize to your husband/photographer for the delay and roll up those sleeves. Roll up your sock like so. Put your hair in a ponytail. I wanted my bun low, so my ponytail is low. If you want it higher um... put it higher. Duh. Thread your hair through the sock. And slide your sock near the end of your pony. 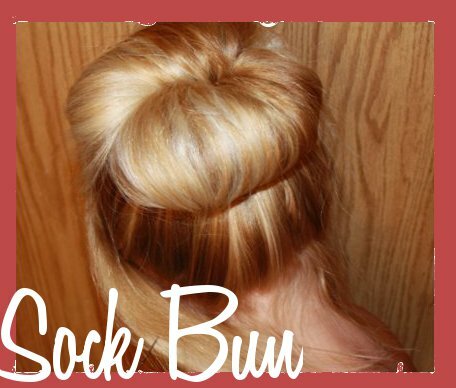 Wrap the ends of your hair around the sock and begin rolling the sock and tucking the hair as you go. Crap (oh wait, I'm actually trying not to say that word) Shoot. Start sweating just a tad. Nix the arm warmer plan and consider marketing this hairstyle as a triceps workout. If you want a low bun, make sure to roll it from a lower position than your ponytail. If it's too high the bottom hairs will get loose and turn your bun into a hot mess. Make sure you have good tension as you roll the sock up your ponytail. If you are worried about the hair not covering the sock as you roll, don't be. I think that was my problem the first couple times, I kept trying to force the hair around the sock before it was ready. It seemed to work around the sock on its own. I did stick a couple bobby pins at the top because I was worried that the hair would shift around and expose my dirty little sock secret. Three tries isn't too bad for a new hairstyle. The skinny: This style only stayed in about half the day. On our drive home from church it suddenly popped down and started rolling out. What!? Good think that didn't happen while I was conducting the music in sacrament meeting. Can you imagine a sock springing forth out of someone's hair and landing in the bishop's lap? Ha ha ha! Aaaawkwaaaard. Anyway, maybe I didn't have it rolled up tight enough or my hair was too heavy or something. This bummed me out a little because I was hoping to have beautiful sock bun curls the next day. I have seen people with shorter hair do this by the way, so don't be scared off if your hair isn't super long. Um, what else... Oh, would I do this again? Sure. I'm thinking next time I dress up as Princess Leia for Halloween I'll put one on either side of my head. I was also thinking I could leave a long piece out, braid it, and wrap that around the bun (which I just typed bum, ha ha) and that might look kinda neat. There is definitely potential with this style. p.s. Do my eyebrows look a little darker? I've been using a pencil on them. Don't tell! Or is it a socially acceptable thing? I don't know. p.p.s. Let me know if you have any projects you want me to link to. I totally will! Woo Hoo! Our first entry! My lovely cousin Jess polished her toes a lovely gray after being inspired by the colors on pinterest. Way to go, woman! They look great! Mari, you crack me up!!! You're hilarious and I love this pinterest challenge week. I've got a pinterest project I'm working on, I'll have to email it to you before the week ends. I love you. Truly I do. Every time I read your blog, I giggle a lot. Mwah. AH! I love it! :) I thought about you when I was going though my "Hair Love" pinterest album (before you even did a hair one), and I tried a little braid thingy I saw on there, but then gave up because I don't actually know how to french braid. So I looked it up and tried again. And failed again. I think it may take a few more than three tries. But I'm getting there. ;) The end. I totally wanted to try this do, but was afraid because my long hair would prove to be difficult. Looks great! Hey I know those gray toes!! I am going to try to finish up some sewing projects this week-how's that? Not pinterest but something that needs to be done. LOVE the hair! Must try this on myself. Thanks! HAHAHAHAHAHA!!!! The Honesty, I love it!